Escape to Takarakka Bush Resort Carnarvon Gorge. Open all year round and fabulous in every season. Immerse yourself amongst ancient rain forest and prehistoric scenery. Choose from a range of accommodation options to suit your taste and budget, from spacious caravan and camping sites to en-suited cabins, safari Taka tents, or luxury studios. Discover Queensland’s premier National Park and top tourist attraction with loads of things to see and do. A haven for both guests and wildlife nestled in a natural wonderland. Explore the depths of the Carnarvon Gorge Queensland, with its ancient sandstone cliffs and rich indigenous history and rock art. Walk the well kept tracks to discover abundant plant and wildlife, and the songs of colourful birds a plenty. Cook up a heart warming meal in the camp kitchens and relax and enjoy the camp fires or book in for a delicious two course roast dinner as a treat after a big day out. There’s plenty of things to do while exploring the Carnarvon Gorge. Take a guided walk, or experience an astronomy tour to unlock the secrets of this special place. 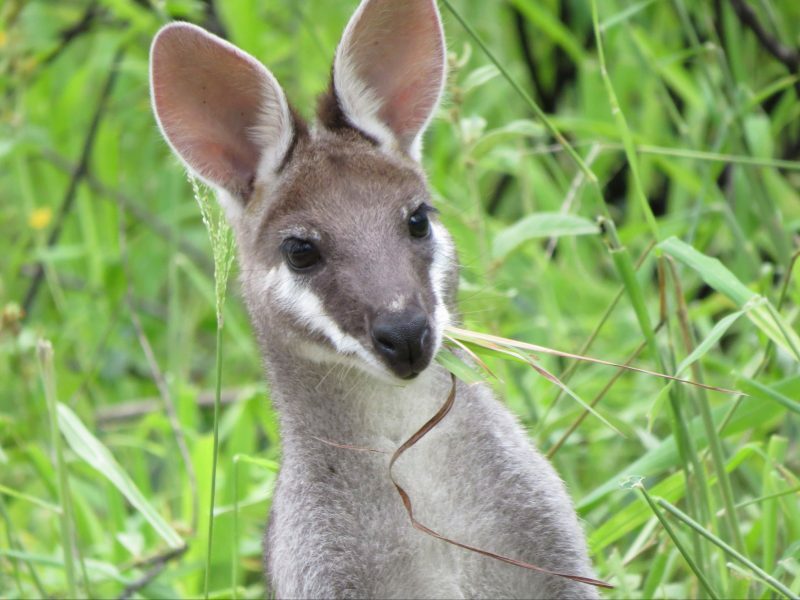 Book your Carnarvon Gorge holiday adventure today. Self Contained Cottage. Best suited for two or three people. Open plan layout. One double bed and large sofa bed. Ensuite bathroom, fully self contained kitchen with gas stove including oven, microwave, saucepans, crockery and cutlery. Air conditioned. Linen provided. Cosy Basic Cabin. Best suited for two people. Open plan layout with one queen bed and ensuite bathroom. Air conditioned with fridge, kettle and toaster, plates cups and cutlery provided. Linen provided. Spacious protected powered and unpowered caravan and tent campsites suitable for all shapes and sizes in a peaceful easily accessible bush setting. Modern scrupulously clean amenities and camp kitchens available. 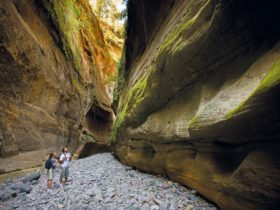 Carnarvon Gorge is on every Grey Nomad’s and nature loving family’s bucket list for good reason. There’s lots to do and see, so relax and plan to spend a while. The average stay is four to six days to truly experience Carnarvon Gorge and all that Takarakka Bush Resort has to offer. Book ahead to avoid disappointment. Open all year round. Enjoy a Carnarvon Gorge camping holiday without the hassle of setting up camp. Your safari tent is close by to the modern amenities and camp kitchen. Just bring linen and cooking gear or ask about hiring to save the space in your car. Sleeps two to five people. Double bed, bunk beds and single beds. Great family accommodation. Light doona and pillows provided. Small fridge and pedestal fan provided. Linen hire available at AUD20 per bed or bring your own sheets and towels. For even more comfort try their newly ensuited Taka Safari Tents. We recommend a four to six day stay. Experience the best in Carnarvon Gorge accommodation. Imagine yourself immersed in nature with the comforts of your newly established studio. Wake to the sounds of the creek as you enjoy a relaxing morning coffee on your private veranda. Plan to stay a while and truly relax and rejuvenate. We recommend a four to six day stay. Advance Bookings Highly Recommended. Open all year round. Even Mum’s a happy camper now. No need to set up camp, or rough it in swags and sleeping bags on this Carnarvon Gorge holiday. Just jump in the car and arrive to your own private ensuited safari tent. Imagine taking your daily walks and returning to your private shower, putting your feet up with a wine on the deck, then having a rejuvenating sleep in a comfy bed before exploring again the next day. Now that’s camping in style. Choose from 3 to 5 berth tents all with pedestal fan and bar fridge and the use of the camp kitchen. Linen available for hire or bring your own sheets and towels. Kitchen box also available for hire at AUD10 per person. Unpowered camp sites through to luxury accommodation. Off-peak season – 1 November to 28 March. Peak season – 29 March to 31 October.